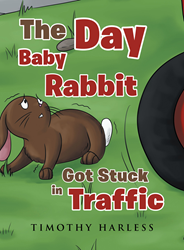 Recent release “The Day Baby Rabbit Got Stuck in Traffic” from Page Publishing author Timothy Harless is a charming tale that imparts a valuable lesson of knowing road rules to ensure one’s well-being. Timothy Harless, a loving husband and father with a passion for writing children’s books for his future grandchildren, has completed his new book “The Day Baby Rabbit Got Stuck in Traffic”: an enjoyable story about a baby rabbit trying to figure out how to carefully cross a busy road unscathed. Published by New York City-based Page Publishing, Timothy Harless’s delightful book also conveys a message of respect towards elders, especially the idea of listening to their warnings about danger. Readers who wish to experience this pleasing work can purchase “The Day Baby Rabbit Got Stuck in Traffic” at bookstores everywhere, or online at the Apple iTunes store, Amazon, Kobo, Google Play, or Barnes and Noble.